ask that they suspend their sister city relationship until the killing stops. THANKS...THIS IS TRULY AN INSANE WORLD!!! 1. You already signed this petition at 5:56 pm PDT, Aug 2, 2009. I urge you to stop your City's sister relation with City of Taiji until they stop killing dolphins. � The dolphins are killed in a secluded cove three hours south of Osaka. 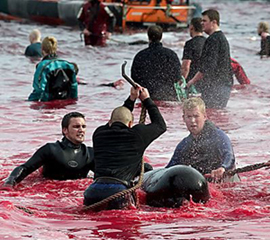 The slaughter is hidden from public view with tarps and nets. Access is blocked by steel gates, barbed wire, razor ribbon and guards. � Only a few people, 26 fishermen, are actually involved in the drive in Taiji. � Migrating dolphins and porpoises are rerouted by 13 fishing boats. They become disoriented when the fishermen bang on long, metal pipes that have been lowered into the water, eventually getting herded, then sealed into the cove by drawn nets across the entrance. Gentlemen, I urge you to reconsider bond advisability with a city which keeps this cruel practice. Thank you for asking the World Association of Zoos and Aquariums (WAZA) to enforce its Code of Ethics against dolphin drive fisheries. We appreciate your help in working toward ending the brutal annual slaughter of Taiji dolphins. Barbaric acts have no reward ... we will remain vigilant! You already signed this petition at 8:37 pm PDT, Aug 7, 2009.
Letters all sent with my personal message to all concerned Simone ! The debate within council and our community over this issue has been intense as the relationship has significant meaning to many people here in Broome. We have a cemetery here full of men from Taiji, many of whom gave their lives for the foundation of this town, and in doing so made a contribution to Australia�s proud reputation as a multicultural country. The wording of the resolution was important for us and we were careful not to use the word "suspend" as it doesn't intrepret well in Japanese and may lead to a position we could never recover from. The result however is that we will not be full-filling the relationship while the practice of dolphin harvesting continues. There are also offers as assistance to transform the industry from one based on killing dolphins to one seeing value in them being alive through tourism etc. Thanks again for your interest in this issue and your email. Please ensure you down load the minutes and read the resolution in full.